This is a list of all available performance metrics that are available in vSphere vCenter Server 6.0. Performance counters can be views for Virtual Machines, Hosts, Clusters, Resource Pools and other objects by opening Monitor > Performance in the vSphere Web Client. These performance counters can also be used for performance analysis with esxcfg-perf.pl, or PowerCLI. cpu.capacity.usage.average CPU Capacity Usage MHz CPU usage as a percent during the interval. cpu.corecount.provisioned.average CPU Core Count Provisioned num The number of virtual processors provisioned to the entity. cpu.corecount.usage.average CPU Core Count Usage num The number of virtual processors running on the host. disk.usage.average Usage KBps Aggregated disk I/O rate. For hosts, this metric includes the rates for all virtual machines running on the host during the collection interval. disk.usage.maximum Usage KBps Aggregated disk I/O rate. For hosts, this metric includes the rates for all virtual machines running on the host during the collection interval. disk.usage.minimum Usage KBps Aggregated disk I/O rate. For hosts, this metric includes the rates for all virtual machines running on the host during the collection interval. disk.usage.none Usage KBps Aggregated disk I/O rate. For hosts, this metric includes the rates for all virtual machines running on the host during the collection interval. mem.state.latest State num One of four threshold levels representing the percentage of free memory on the host. The counter value determines swapping and ballooning behavior for memory reclamation. power.capacity.usable.average Host Power Capacity Usable W Current maximum allowed power usage. power.capacity.usagePct.average Host Power Capacity Provisioned % Current power usage as a percentage of maximum allowed power. 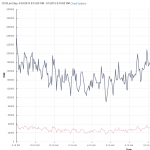 vSphere 6.0 Performance Metrics - What is CPU Readiness? vSphere 6.0 GA - vSphere Client back, or not?